before writing her latest book, the murders at white house farm, carol ann lee spent three years corresponding with the jeremy. my correspondent is one of britain's longest serving prisoners, convicted of fatally shooting his parents, sister and her two young sons in 1985. the white house farm murders are among the most notorious crimes committed within living memory. three generations of the same family obliterated by one of its own has chilling implications for us all, undermining a fundamental belief about where we are safest; when we lock our doors at night, we do so to keep danger out - home and family are our greatest security. the notion that we can never really know those closest to us is deeply disturbing. 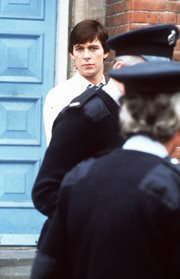 jeremy bamber has always protested his innocence. my aim, in writing a book about his case, is both to examine the claims he has put forward and to explore the relationships within the family prior to the violence unleashed in the small essex village of tolleshunt d'arcy that august night. i want to do so neutrally, allowing readers to make up their own minds about jeremy bamber, who agrees to answer my questions but declares: "i believe that you will follow the evidence wherever it takes you - and i also believe that if you do conclude by the end of your research that i am indeed innocent (i am), then you will say so, as you will if you conclude that i am guilty (i'm not)." i ask him how he copes with the resounding disappointment of being told yet again that he will remain a prisoner. his reply is simple: "hope. hope is what makes the difference in me between life and death. not for freedom, but for the truth to be acknowledged by the courts." when depression caused by fresh defeat does take hold, he is silent, writing only when the stultifyingly low mood has passed, and collecting quotations that renew his confidence. "the innocent and the beautiful have no enemy but time" (wb yeats) is one; "the evil of modern society isn't that it creates selfishness, but that it creates conditions in which people who don't suffer from injustice seem incapable of caring very much about people who do" (junius) is another. but gradually, his letters tail off. there are problems in prison for him and a planned visit doesn't happen. in the end, he states baldly that he can "no longer write meaningful letters" about his case. after that, there is nothing, and then i hear that he has been moved to wakefield prison after many years at full sutton, which is scarcely a five minute drive from my home. distant in place and person, he now has to confront the milestone of thirty years in captivity, and thirty years since his family were murdered. by him? that's for readers to decide.